During our one week vacation in Iceland, we only stayed in an actual hotel once. That was on our first night in the country. While often spartan and always unique, we enjoyed the diversity of our bed and breakfast choices. We ate delicious food and drink everywhere, even in the most isolated places. By the end of our time we came to appreciate the ubiquitous cod and potato meal, and to yearn for Skyr, a yogurt like dairy product made from whey. Our trusty guide book pointed us to places where we could get a reliable meal in the most out of the way hamlets. Icelandic hotel rooms reminded me of an Ikea display. Nowhere did we see wall to wall carpeting. For me, carpeting is the clue to a good hotel. Is it shabby and stained, old and worn out? Without any carpeting, the rooms were clean and fresh. On our first night in Iceland we noticed that the bed didn’t have top sheets. Icelandic beds are dressed with a bottom sheet and covered with a white duvet over a down comforter. Even on a queen or king sized bed, there were always two comforters, one for each guest. We were extra cozy with the geo-thermal heat that warms every home in Iceland. They are blessed with an abundance of underground natural heat. Flooring is light, bedding is white, and furnishings are sparse giving the rooms a feng shui feeling that makes an American embarrassed cluttering it up with too large luggage and too many belongings. 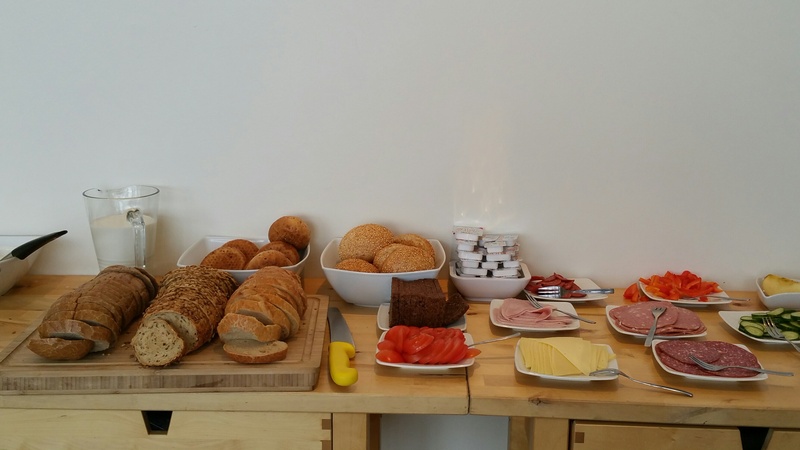 Icelandic breakfasts are hearty and healthy. There is the ever present Skyr, that creamy lusciousness that, because it’s made from whey, the healthy part of the milk, has basically no cholesterol or fat. For these reasons it’s a better choice than yogurt. Then there was bread, one or more kinds, usually brown, always accompanied by rugbrauð, an Icelandic dark rye bread baked by the heat of the earth. It’s sliced thin and slathered with butter and jam. One place offered pancakes and eggs. Every place had sliced meats and cheese, and fresh fruit, usually apples and oranges. Sometimes we had fresh squeezed orange juice and breakfast pastries. Lunch and dinner were tougher. Once we got out of shouting distance of Reykjavik, we passed through tiny villages of a few hundred souls. We learned to start asking the locals where to eat. Otherwise we were limited to a hotdog at the little stores attached to every gas station, or fish and chips at what I would call a diner. I drew the line here. Not only do I not eat meat, but I shy away fro processed and fried food. These limitations notwithstanding, we did eat some fabulous meals. A typical meal: cod, potatoes, and a salad of cucumber, tomato and red pepper. We ate this combination a lot. While Americans rarely if ever see Cod on the menu in the States, in Iceland it’s as common as a can of tuna fish is in American cupboards. Our guesthouse outside of Hella served dinner each evening for a not so small charge, but to be honest, it was the best game in town and probably for twenty miles. They served salmon and potatoes the night we stayed there with soup and salad and home baked bread. Desert was a cookie crust layer covered with vanilla laced Skyr. In Glindavik we had fish and chips made with . . . you guessed it, Cod. A few days later we were staying outside of Budir. This guesthouse also served dinner, and it was good food. The choices were lamb or fish. What kind of fish? Cod of course! Fish in Iceland is fresh and tasty. Larry tried the Icelandic specialty, lamb soup. I ate a lot of soup as well: carrot soup, cauliflower soup, and tomato soup. When you live in a country where it’s in the 50s in the summer and the wind is strong enough to bend your car door if you’re not careful, you need a lot of soup! Once we were closer to Reykjavik, we were able to get treats like cafe latte and cappuccino, and even — hang onto your hat, decaf coffee. Icelanders like their coffee and pastry. We discovered bakeries and pastry shops that had delicious croissants and brioche, and cakes. After nearly a week of trekking around on roads where towns and houses were few and far between we enjoyed coming back to the city life and food of Reykjavik. Because Iceland is so far north, and because it’s covered with volcanic rock, there isn’t much you can grow. Potatoes are the typical side dish with meat or fish, and French fries are also common accompaniments. Other vegetables we noticed were cabbage and onions. Salads consisted of tomatoes, peppers (usually red), and cucumber. These are grown in hothouses warmed by thermal heat. Often before we dug we paused to appreciate the presentation. I couldn’t resist taking pictures of our luscious dinners. A yummy meal in Vik: Charr, roasted potatoes and of course, salad. What were my favorite places and meals? We loved our Budir guesthouse with its cozy gathering place and scenic setting at the base of a mountain. The town of Vik had a busy restaurant where we feasted on cauliflower soup and Charr, washed down by the Icelandic beer, Viking. While pizza was a common item on the menu, we steered away from that and avoided hamburgers as well, sticking with local fish and in Larry’s case, lamp and beef. 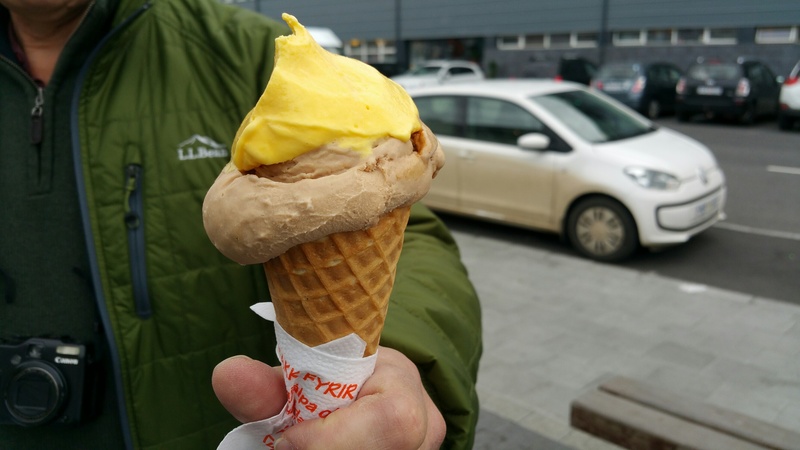 Even in the most cold weather, Icelanders like their ice cream. The view from our room outside of Hella. The guesthouse was also a horse farm. Need I say that the animals in Iceland do not live in crowded barns or pens? Sheep, cattle, and horses roam free outside. Like most European countries, farmers in Iceland do not put any antibiotics or growth hormones in their farm animals. 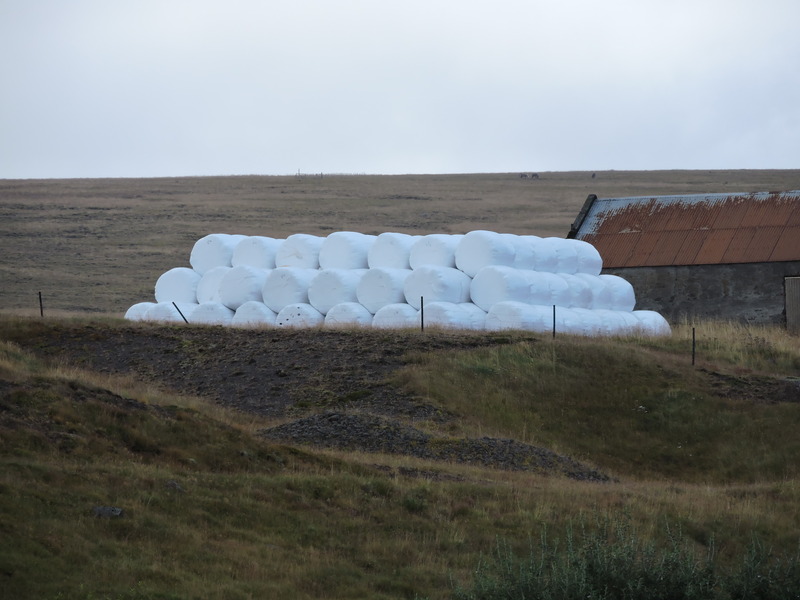 Everywhere we went we saw piles of the fat, round plastic packages stuffed with hay stacked near every farmhouse to feed animals during the winter. Wrapped inside these tidy packages is hay. Usually white, we also saw colored wrappers. The friendly staff at the guesthouses were mostly from elsewhere. We met young people from Greenland, Denmark, Norway, Spain, and the Netherlands. What they had in common was a willingness to work long hours, in the kitchen as well as in the stable, and a love of travel and people. Icelanders have a reputation as one of the happiest people on earth. They are not the wealthiest, and their weather and environment is harsh. Still, it’s hard to leave Iceland without absorbing some of the people’s innate contentment and positive outlook on life. We took a wrong turn and ended up on this gravel road. 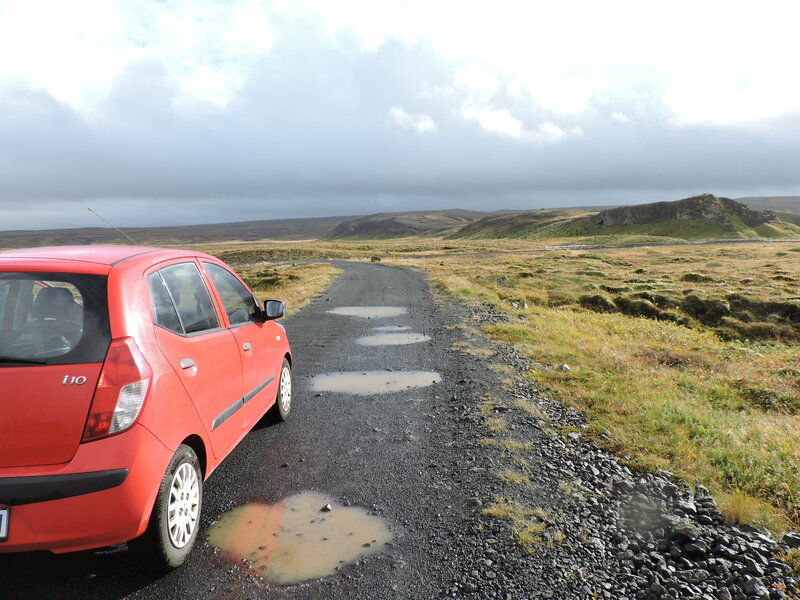 The rental car agency warned us not to go off paved roads with our tiny car. Four-wheel drive vehicles are requited for off road travel.